So my first contest and I don't have much time either (I'm a little bit late and going in vacations in 4 days...). That's why I'll do something relatively simple: A Spell Ability that could be in League of Legends. 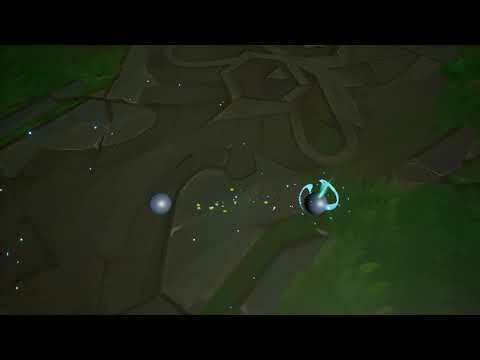 It will be a spell that lift leaves in the air and then surround them with energy before throwing them at the opponent (Kinda like Azuma's Chakra Blades), it will be stylized and close to League of Legends look. I worked on it today that's what I got for a base ^^ So basically this is the timing i want (or really close) I'll work on the aesthetic tomorrow, change the sphere gradient for a real texture, add a trail to the leaves, etc. One thing that bothers me is that there's not a moment with big interest, and since I'm creating it for a game purpose where you don't want to wait 3 seconds for the effects to do what's it's supposed to do, I don't have much time in my timing for the "release energy" effect. I would say that you shouldn't be worried about the 'gameplay' part too much (2014's 1st place takes about 1 second to wind up the attack). The 'gameplay' part that I would concern is the clarity, visual noise, so basically all thing visual. The 'cast time' and 'linger time' is not super important in this context, and you should experiment and have fun with it! Just letting you know I watched your threads... everyone is doing something awesome, I'm sure it will be hard for the judges to decide! After looking many time that gif I noticed that it needed something on the "charging" part, I started with something more on the ground (a plane effect kinda like an incantation circle) but didn't worked out so I tried with meshes that would propose a lifting action. Then I wanted to put the same thing on the impact but didn't looked to good, while playing with it (trial/error) I got something that added secondary movement that I like. 1. I think your missile lack internal movement. Your leaves are static and does not have any movement besides toward a target. I think you could have it move around a little bit within the clump itself. 2. The dissipate effect is super abrupt. Try slow-out the swirl or make the explosion fades as it dissipate. 3. Under most circumstances, particle should fade away. Either reduce its size to zero over its life or makes it fade away. 4. This is my personal opinion but I think your background should be un-textured. The bleed effect is hard to notice against the background I think. To add on to Kassyndra, for the sake of working out timing properly, I like to setup a blueprint for Time Dilation so that I can hop into 'Play' and either play it at normal speed (2 on keyboard), slow it down to check specific timing (1 on keyboard), or quickly skip past what I already have developed to reach a point I want to check (3 on keyboard). When you start fixing up the projectile hit to disappear as soon as it hits the target, having those controls could end up being really handy for timing as UE4's pause and 'frame skip' just aren't very good atm. I think that for your missiles, they're also too large, or too far apart as at the moment some of them barely graze the sphere but still get killed off. Might be worth taking a look if making the space between them a bit smaller and reducing their size slightly so that they all hit the target helps. Thanks for the time dilatation tip fakado ^^ I was using the command slomo but shortcut could be helpful! 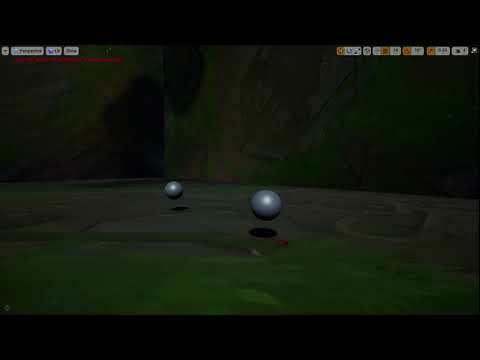 Projectiles aren't getting killed on hit, but by lifetime, it's just that the sphere two is slightly at the end of the lifetime. Do you think I should increase the lifetime to remove ambiguity? I'm a little stuck here.. I've focus on the dissipate effect which I don't find perfect but it fits and adds something. I've set the lifetime of the projectiles longer. 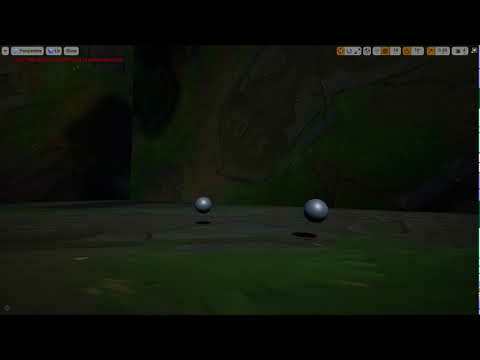 I tried adding some movement to the projectiles (I don't really need to change the trajectory, I know I can add something to make it work) And that's where I'm stuck, I tried the thing on the floor, which isn't bad but isn't good, Gameplay wise it's useful because that will be the area where you get damage so I let it there. I tried some smoke, more dust, I tried something in the front like a meteor, etc. Can't find something cool.